How could you NOT pamper a little furry white princess as cute as Cookie? Cookie, a true princess among Bichons, goes to the Petsmart puppy spa once a month for the “Top Dog” treatment. It starts with a soothing oatmeal bath to help prevent dry skin, followed by a conditioner to keep her beautiful coat luxuriously soft and white. Next, is ear and teeth cleaning–a must for every well groomed canine cutie. Then the styling begins. 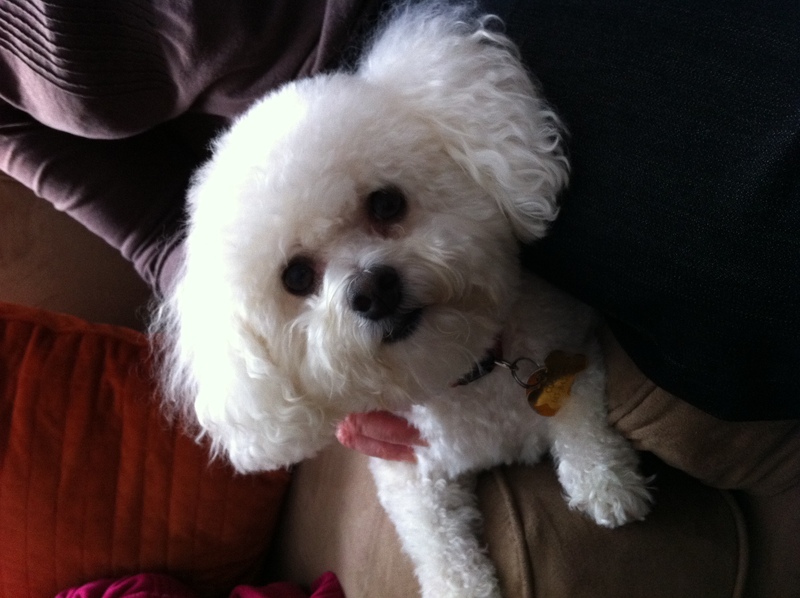 . .
Bichons have a thick curly undercoat and a straight outer coat. They must be groomed carefully so that their little heads are round and their faces maintain that adorable puppy look. We have asked our groomer to hand-clip around Cookie’s eyes so that she has a softer look (one groomer shaved around Cookie’s eyes and she ended up looking like an owl). We also have her little bottom hand clipped so that it doesn’t look like a flashing beacon when she walks away. With grooming done, next comes a pedicure, complete with buffing so that her nails are round and smooth. Our groomer always puts a pretty bow on Cookie’s collar, making her look ever so much like a birthday present just waiting to be unwrapped! Yes, a trip to the puppy spa is expensive, but we don’t drink, don’t smoke and don’t waste money on junk. So, with all that “extra cash” floating around, we can afford to give Princess Cookie the Royal Treatment! I just love hearing Cookie stories and seeing photos!